EURJPY is under the influence of some economic reports such as Real Household Spending (YoY), Unemployment Rate, Job-to -Applicant Ratio, Industrial Production (MoM) and Industrial Production (YoY) in Japan. 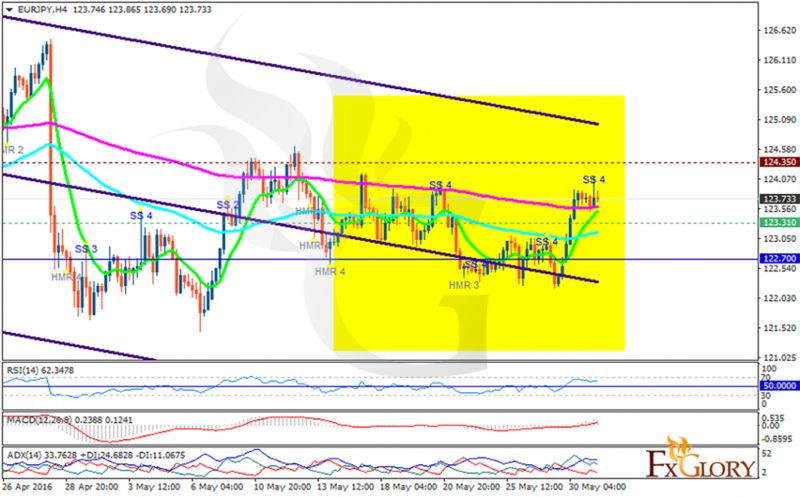 Yesterday EURJPY moved with bullish bias but today it created a choppy pattern. The support lies at 123.310 with resistance at 124.350 which both lines are above the weekly pivot point at 122.700. The EMA of 10 is headed upward crossing the EMA of 75 but both lines are below the EMA of 200. All indicators are signaling buy opportunity; the MACD indicator is in positive territory, the RSI is above the 50 level and the ADX is showing strong buyers. The resistance level breakout will push the price in higher ranges targeting 125 however there might be a pullback any time soon.